As I mentioned on my official Facebook page, another article about the book appeared in today’s Cherokeean Herald. Just a reminder that the eBook of Welcome to Newtonberg is free for download at Smashwords.com through January 2, 2013. Simply enter coupon code LA27B at the checkout. Well, the press releases paid off on at least one front. 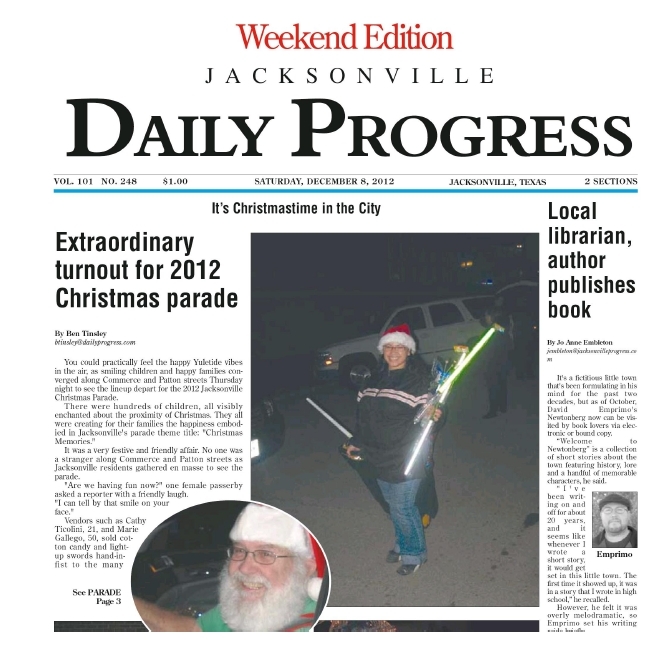 An article about Welcome to Newtonberg and self-publishing made the front page of the Jacksonville Daily Progress, our local newspaper. Still, I’m quite happy with the article. 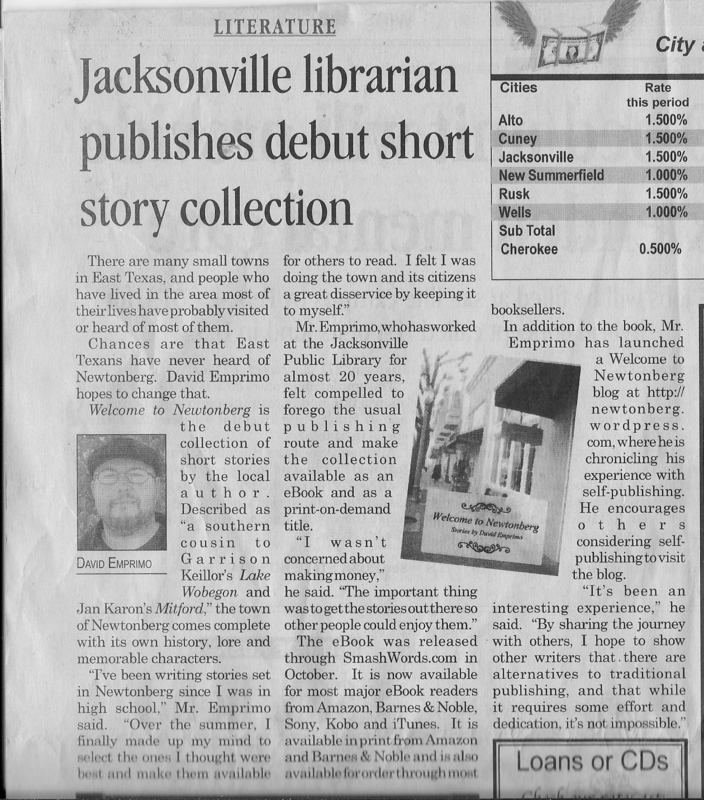 There are a couple of details that aren’t quite right (for example, I intended to publish a book of twelve stories, not publish one story a month; likewise I ended up with a book of six stories — I’m not publishing a story every other month); but all in all, it’s getting the word out there about the book so I’m happy. I’m still looking into getting copies of the eBook out to book review blogs. Does anyone have suggestions about that? I could just go looking for review blogs and e-mail the people in charge, but is that how it’s supposed to be done? Is there a main Website that lists books available that reviewers read and select books they want to review? Let me say this at the beginning: self-promotion goes against my nature. I dislike drawing attention to myself. I’m not a social person. So the idea of promoting my book — basically saying “Hey, everybody, look at me!” — totally rubs me the wrong way. But how would people who don’t know me even know they might want it? And so we’re back to publicity. I’ll be honest: I haven’t done near as much to promote this book as I should have. I know it’s only been out for two months, but still. Other authors would have been all over the Web, posting information about their book everywhere, firing off mass e-mails to every library and bookstore within three hundred miles. I haven’t. As a librarian, I have to admit my heart drops to my knees when someone wants to give us a book they self-published. Or (worse yet) wants us to BUY their self-published book. There’s nothing that makes me more determined NOT to read/buy a book than the author telling me I should. But now, having self-published my own book, I can sort of understand them. I still don’t condone their methods, but I understand why they do it: To let people know it’s there if they want it. So what have I done to promote this book? Well, I’ve set up this blog. I’ve promoted it to my friends and family on Facebook, who have promoted it to THEIR friends and extended family. I’ve sent out a press release and photos to four of the area newspapers (none published yet, but I just sent them out on Monday). I’ve created a Facebook author page for myself (just launched at https://www.facebook.com/demprimo). And I’ve gone through what I think is the proper procedure to get the book placed in the library where I work. What was that procedure? I approached the Director and told her I had a book available. I basically “pitched” the book to her and asked if the library would be interested in a copy. I GAVE that copy to the library so there couldn’t be any sense of favoritism or impropriety of them buying a copy since I work here. I personally think that’s the method that should be followed: let the book go through the same channels as a “professional” book. Don’t just give it to the library and expect them to put it in because you’re a local author. There are plenty of other ways to promote the book, but most of them cost more money than I have, or am willing to spend. I could have my book reviewed in the professional journals, but that costs several hundred dollars. I could buy ads online. I could send out review copies to book review blogs. But again, all of this costs money. Even the review copies cost me about $6 apiece after you add in the cost of postage. I think my next step will be to offer a free copy of the eBook to anyone who wants to review it online, but I think I need some feedback on that. Has anyone else done this with their own book? What was your experience? Would you do it again?